Link to IMDB here. Go see it. Who knew making sushi could be so existential. The slow-motion (and sped up) preparation scenes were breathtaking. It reminded me of that scene in the Last Samurai where Tom Cruise says “From the moment they wake, they devote themselves to the perfection of whatever they pursue. I have never seen such discipline.” After watching it, I wanted to go back to Japan just to try his restaurant before the inevitable happens. Published on April 9, 2009 in Food and Wine. 2 Comments Tags: Food and Wine. A buddy and I just went out to lunch and had this, the king of all sandwiches. He found it randomly by surfing Midtown Lunch, a website subscribe to but clearly I have been underutilizing it, since I hadn’t heard of this place before. Midtown Lunch calls this sandwich from Free Foods a triumph, and they are right on. The sandwich isn’t even on the overhead menu, you have to ask for it, and I would have never known to were it not for ML. Anyway, the sandwich is awesome. 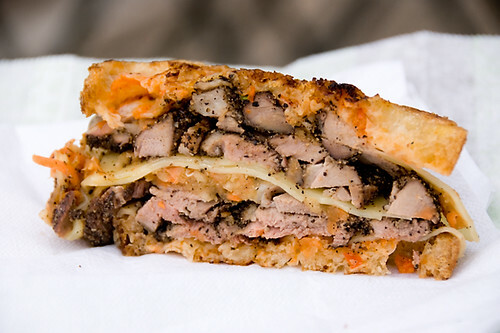 Tender, juicy duck, swiss cheese, russian dressing, and is that tiny bits of orange? A genius made this sandwich. A goddamn genius. A mother#$@#, lyrical wordsmith, mother @#!$@ genius. Why no ban on Chinese food imports? Published on May 21, 2007 in Big Jerks, Brilliant Ideas and Food and Wine. 6 Comments Tags: politics. The Pet Food Crisis. A few months ago, a scandal erupted when Americans discovered that hundreds of pet deaths in the United States were attributed to poisoned pet food manufactured in China. More than one pet food manufacturer was involved, it quickly became clear that the poisoning was intentional. More importantly though, it was clear that the substituting of one ingredient for another was intended as a cost-saving measure. In other words, it was completely profit based. Disgustingly, China denies blame out of one side of its mouth while out of the other side it takes action against the manufacturers. Wikipedia has a comprehensive summary of the pet food crisis if you want to read more. Poisoned Toothpaste. Two days ago, the Times ran a story (free reg req’d) that toothpaste found in Panama and manufactured in China was found to have the poison diethylene glycol. That story followed on the heels of a previous instance in Panama where diethylene glycol marked as glycerin (a sweet syrup you find in all kinds of processed food), manufactured in China, was mixed into cold medicine, killing 100 people there. According to the article, deaths linked to food manufactured in China have occurred in Haiti, Bangladesh, Argentina, Nigeria and India. In fact, the same Chinese company implicated in the Haiti poisoning also shipped about 50 tons of counterfeit glycerin to the United States in 1995, to an American bulk pharmaceuticals manufacturer. Poisoned food. In addition, hundreds of shipments containing thousands of tainted products including food products, medicines, dietary supplements, and cosmetics manufactured in China have been discovered by U.S. officials. While they stop a small percentage, a much larger percentage is making its way into American homes. Moreover, unscrupulous Chinese entrepreneurs callously ignore poultry and meat import bans to the tune of hundreds of thousands of pounds of tainted flesh. So what the hell is the matter with our government? Why aren’t they trying to stop this? After all, isn’t the first function of a government to protect its people? After all, didn’t other first-world countries like Japan and the UK ban US beef after the mad cow scare? According to the Washington Post article, the contemptible reason nothing is being done is money. Because our trade is so inextricably intertwined with China, and because Americans are so obsessed with the desire to import items in to China, we take a weak approach to exports out of China to the U.S. The Math Ain’t Right. Fine, I get that our representatives lie prostrate in front of the Almighty Dollar. But here, even the math doesn’t make sense. According to the Post, agricultural exports to China total only $5 billion a year, while the Chinese enjoy a $232 billion annual trade surplus on the US. So where is the economic benefit? It seems to me we could kill two birds with one piece of pet food if we reduced the trade deficit with China by enforcing some REAL restrictions on the import of agricultural products. If you think that is a good idea, it takes only a quick call or email to your representative in order to let them know you care about not being poisoned by Chinese imports. Published on December 28, 2006 in Big Jerks and Food and Wine. Closed Tags: Food and Wine, perry street, snobs. Before Christmas (usually a dead week for restaurants here in NYC), we decided to stop by Perry Street (located, quite unimaginatively, on Perry St. and the West Side Highway)(Opentable, Citysearch, Zagat), which I suppose is in the financial district or the FAR west village. Though we did not have a reservation, there were several four person tables available (we were three). It was not that they were reserved, rather, they only wanted to seat parties of four at those tables. We sat at the bar for a half an hour while several of these tables went empty. At about the 40th minute we decided this had gone on long enough and spoke to the manager. Despite pointing out the blatantly obvious, they still refused to seat us even though their tables were still empty. I don’t know about you, but I just don’t see the point in being treated like crap at a place where you are expected to pay around $100 per person to eat! It’s not as if Jean-Georges himself was cooking for us. We decided to pass, and spend our money (ironically) at Spice Market. They gave us a table at Spice Market but it too was crap. However, at least our complaints at Spice Market were heeded, and they moved us to an adequate table. Jean Georges needs to fire the high priced consultant that told him it was better to have an empty table than a table not filled to capacity. Too late for me though, because there is no chance of me ever going back to Perry Street. Buggers! Published on December 15, 2006 in Food and Wine. Closed Tags: Food and Wine, tribeca. Here’s an old post I never published. Tuna Tartare with Chinese Celery, Crispy Lotus Root & Soy Tapioca. The thing that really set this apart from every other tuna tartare in the city was the use of the mini tapioca pearls cured in soy sauce. I thought that was a very creative alternative to including soy sauce in a dish on the side like so many other Japanese restaurants do. Lacquered Pork Belly, Shallot & Ginger Confit. Amazing. It wasn’t on the prix-fixe menu but we ordered it anyway, and we were glad we did. It was possibly the most tender pork I have ever had, and the crystallized or fried ginger on top made the dish. A must-try. Chili Prawns with Lily Bulb & Sweet Walnuts. Pretty good. Medium sized portions – not too small, but not quite big, either. Though the waiters took their sweet time bringing it after the entrees had already been served, it came with fried rice. Overall: I think its pretty good, if you can schlep all the way out to Tribeca!